No matter who you are, no matter where you are on life's journey, you are welcome here. How wide is our welcome? What are the Church’s Beliefs? James Sperry’s name has been on the Rush Henrietta High School build-ing since it was built in 1968. Who was he and why is the high school named for him? James, a surveyor, arrived here in Henrietta (West town) in the very early 1800’s and settled near what is now Lehigh Station Road and West Hen-rietta Road. He is literally a founding member of this congregation which start-ed meeting at his father Moses Sperry’s home who had arrived around the same time as James. His name is mentioned at almost every meeting held well into the late 1800s. 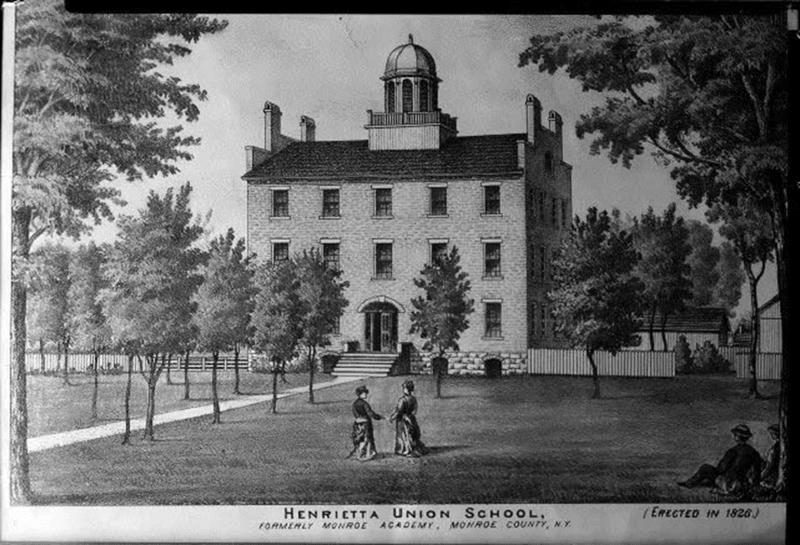 By 1826 James, along with Joseph Brown, Antoinette’s father, had built the Monroe academy on East Henrietta Rd by gather-ing subscriptions. It is amazing to think that only eight years since the town was founded in 1818 there was an institution such as the Monroe Academy. Andrew Jackson was president of the United States when these citizens worked to get this school built. Monroe Academy was not the usual one-room building with stove and coal box in one corner. It was an imposing building of three stories sur-mounted by a belfry tower. Later the top story was removed. This was the first secondary school built west of Canandaigua. Courses such as Latin, Greek, bookkeeping, algebra, geometry, geogra-phy, history and chemistry were taught. It was co-educational, incorporated as a Lancastrian school. It continued to function as a private school until 1886 when the building was used as a Union Free School. In 1925 a four year high school course was added to the curriculum. The building operat-ed as the Rush Henrietta high school until the new central building was constructed in 1951 (now Roth Middle School). It became the Southeast YMCA until it burned in the 1970’s. James Sperry was a mover and shaker in the world of education and that is why the current RH high school is named for him. During his years as a member of this church he was the treasurer. I have found records from 1934-1954 that list him as treasurer and his wife Nellie as church clerk. According to an article written at the time of the Dedication of Burger Junior High in 1965, his great granddaughter, Margaret Hoh, is quoted as saying, “Carefree and easygoing, Henry had a good head for figures and a sharp memory.” At the age of 79, Henry and Nellie celebrated their 50th wedding anni-versary in 1949. Henry died in March of 1957 at the age of 83. At the time of the church’s centennial in 1916 Mary Kirby Calkins wrote a paper on her reminiscences. She was nearly 80 years old. The paper was not read at the celebration but was later published in the Democrat and Chronicle under a column referred to as the Perculator. It gives me great pleasure to be back once more among my old friends and acquaintances to celebrate this happy occasion. And as I have been invited to tell you some of the incidents connected with the early history of this church I have had to put on my thinking cap, and go back a long way. I am not quite certain whether the honor of being the oldest member now living belongs to Mrs. Alva Springer or myself, but I have been a member here since I was a child of 13 or 14 years, and as I think back that seems quite a long time, although of course I will not admit being old. However, I will try for the benefit of the younger generation to take you back to my childhood days, and tell some of the things I remember in connection with the church. I do not know as I ever saw the remains of the old log church which was built in 1818, or have been told about it, but it is my impression that it stood near the corner on the east side of the road leading to Maplewood cemetery, south of the Uniman farm. The second church built in 1832 stood facing the west, on the same lot it now occupies, with a gallery on the north, east and south sides. The choir occupied the east gallery and the pulpit was on the west end of the church and so high that unless the pastor was very tall, he had to stand on something in order to be seen. We had a fine choir in those days (I was one of them), and Sam Seeley I think was the leader. Our only instrument was a bass viol from which same drew the most doleful music. The first minister that I remember was Mr. Ashman, and I could not have been more than three or four years old, when he was pastor here. I think my remembrance is of his little son, who was about my age and with whom I used to play rather than of his father’s sermons. Then there were a Mr. Murray and Mr. Bartholomay, who preached here but I cannot tell the order in which they came. The first sermons that really impressed me were preached by William B. Brown, brother of Antonette Brown Blackwell well known suffragette preacher whom perhaps some of you may remember. Then came Mr. Streeter, a kind good man who was with us several years. Then Mr. Bosworth, who afterwards performed my marriage ceremony in 1865. After he left we had a number of pastors who stayed on a short time. 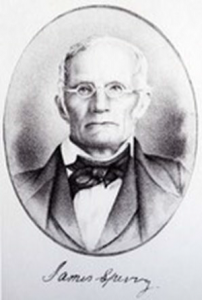 Just about this time a Mr. Burman an evangelist, held meetings for several weeks and drew crowds with many converts. We also had our discouragements years ago. It must have been when I was quite small a Mr. Wheeler preached in the church and, because of a peculiar belief, had many followers who called themselves Wheelerites. This caused a division in the church and about half of our congregation went with him holding meetings on the corner where Mrs. Wagner’s home now stands. The church excommunicated those that left, but at the time Mr. Merrill was here (He was pastor when the old church burned in 1867). He thought we had done wrong in excommunicating any one. By a vote of the church, it was decided to take them all back on expression of faith but I think only one member returned. In those days we had preaching on Sunday in the morning, Sabbath school at noon, preaching again in the afternoon and sometimes in the evening. We were all expected to be there many bringing their dinner. Not much time for automobile riding in those days. Among those always present were the three Beebee brothers, Deacon Sperry and Gooding, Deacon Brown, Gage and Hamilton Brown, Martin Roberts, Luther, Starkweather, Holcombe Hazelton, John and Sam Robertson and Deacon Seeley and his son Sam, who had a long covered wagon that held fifteen or twenty people and in which he brought those from Ridgeland who had no other way of attending. Sam was sexton for years and he and his wife took a great deal of pride in keeping the church a spotless, but I believe it was the new organ that was too wicked for him. For I remember he strode up the aisle just after the service began and threw down the keys on the table that stood in front of the pulpit, with a clatter that was heard by every one, and walked out of the church. Deacons Brown and Sperry occupied adjoining pews, and as soon as the sermon began closed their eyes and Deacon Brown always opened his mouth also. I have heard him say he was not asleep but could hear better with his eyes shut, but there was a sound that came from those pews, that I did not connect with deep thought. In the gallery Sam Seeley did the same kind of thinking. I guess they must have had perfect confidence in the minister doing all things well. I have been asked if my father did not give the grounds for the old church. I am not certain, but think he gave the ground it stood on with the right of way to and from the church. As I know he owned the land all around it. I think that although we had a strong church at the time, they were not very good business men, for my father offered them the deed to all of the land in front of the church for a park if they would fence it in and set out trees. After urging it on them for a number of years he finally fenced it himself. For years it was known as “The Green” and was principally occupied by a flock of geese, of which I was mortally afraid, as they always hissed their disapproval of me every time I went by to school. It was discovered when they wished to get a loan to build the parsonage that they did not own the land the church stood on and that although they had voted to change the name to First Congregational church of Henrietta it had not been done legally. My sisters and I gave them a deed at that time to the land now occupied and they took legal measures to have a right to the name. After the church was burned, They decided to build the present building in the farther corner of the lot, fronting on the east road and it was first designed on a smaller scale, but the day it was dedicated, January 26, 1867, William B. Brown was here and thought we should make preparations for a larger congregation and it was decided to add twenty feet more on the north side. They took subscriptions on that day for paying off the debt, and while the subscriptions were still coming in, Dr. Vosburg called a halt, saying they had raised enough money for all expenses, but alas! When they came to settle the bills, they found they were short and were obliged to sell the parsonage, the house now owned by W.E. Fretts. I recall also in the Methodist Episcopal Church the two Williams brothers, Mr. Leggett and Father Calkins, who used to break out, whenever there was a silence in prayer meeting with “Here I raise my Ebenezer,” which seemed a favorite hymn of his. As a child I used to wonder why he wanted to raise Ebenezer, and if it was Ebenezer Gooding, the only Eb. I knew. The ages mentioned were confusing. Mary had memories back to 3 or 4 years old but mentioned becoming a member at 13 or 14 which I believe would have been when she was confirmed and officially became a member. The 1832 church building would be near the corner where the Sunoco station is now at East Henrietta Road and Lehigh Station Road. There used to be a historical marker at that corner marking “the Green”. The 1867 church was farther from the corner where the apartments now stand. I have left out parts of this paper just because of the length. She also talked about the number of Seminary students who were ministers when the church could not financially support a “settled minister”. 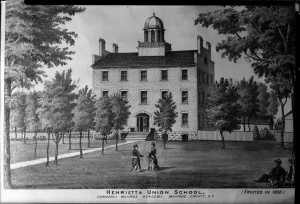 I hope these memories help you picture Henrietta UCC as it existed in the 1800’s. Yes, we have many boards and committees, and this was true all the way back to our beginnings. As I was reading the minutes from meetings in 1835, I came across a committee we no longer have. This committee seems to have lasted for about 10 years. It was called the Committee on Discipline. Yes, discipline, and it worked very much like a court. This committee would meet with people who were not “living up to the expectations of the church”. These committee members would “labor” with said members. I presume that meant counseling and praying. Nathaniel Lockwood was excommunicated by resolution on February 19, 1835, for not attending communion on the Sabbath and not attending all religious meetings of the church, which violated his covenant obligations. He also would not allow his wife to attend her church, the Baptist church. He basically told them he had no intension of changing, so the resolution of excommunication was issued. In April of the same year, Anna Jones admitted to the committee that she had made disturbances in the Sabbath School and Bible class by talking and laughing, even in times of prayer. She had also been guilty of using profane language and of other unchristian conduct. She likewise was “cut off from all the peculiar privileges of church membership.” This resolution would be read to the whole church. The last one I read about was Joseph Brown— yes, Antoinette’s father. He was actually asking to separate himself from the church for several reasons. He did not believe in infant baptism, he disagreed with the requirement of admission to say that they will abstain from the use of ardent spirits as a drink, and the requirement of attending every prayer meeting and communion. In this case, the matter was tabled and he and his family remained members for many years. This was his way of protesting the resolution of March 6, 1834, where the committee adopted a resolution against all “ardent spirits”. There were 3 parts to this resolution. The first was that the “evils of intemperance have been so long and so glaringly before the public mind that the serving or using of ardent spirits is inconsistent with the Christian character.” Second, they were asking all members to sign a temperance pledge. And last, that they would not admit any new member who would not abstain from dealing in or using spirits, except for medicine. The interesting thing was that it took until June 14, 1846, before the church discontinued the use of alcohol for communion and switched to grape juice. The excommunications took place from 1834-1843. In 1869, Dr. Vosburg set up another committee to examine the old resolution which stated people refusing to walk with the church in charity and Christian affection, or irregularly attending the church, should be expelled. It is stated in minutes that there was excitement of the times—I’m not sure what that was all about— but he felt that the people still in the area should be asked back as they were judged with needless severity. He felt that growth and usefulness of the church was impeded by the previous position and therefore all persons should be reinstated, if they were willing to confess their faith and a willingness to walk in church relations with the congregation in according to the covenant. After this they could be reinstated to all privileges and duties of membership. After the resolution was passed, a Forefathers Day was planned for December 22, 1869. The First Congregational Church of Henrietta was a forward thinking church and purchased a stereopticon in 1915. What is that, you may ask? A stereopticon is a slide projector or “magic lantern“, which has two lenses, usually one above the other. These devices date back to the mid 19th century, and were a popular form of entertainment and education before the advent of moving pictures. Americans William and Frederick Langenheim introduced stereopticon slide technology—slide shows of projected photographs on glass—in 1850. For a fee of ten cents, people could view realistic photographs with nature, history, and science themes. At first, the shows used random images, but over time, lanternists began to place the slides in logical order, creating a narrative. This “visual storytelling” directly preceded the development of the first moving pictures. We purchased one in 1915 for $58.00, and bought an organ the same year for $450. $225 came from Andrew Carnegie. Was this the famous one, or was it a foundation which gave out grants etc. in his name? Good question, but after combing through all the minutes nothing was ever mentioned again. In 1950 the young people of the church earned money to purchase a 16mm movie projector. What was used between 1915 and 1950 was not recorded, but I am sure there were advances in between. When did our church purchase its first copy machine? Did you guess 1922? I bet not. Yes, the Brotherhood purchased the first copier at the request of the pastor. 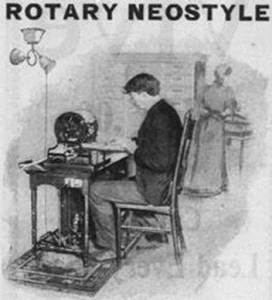 The Neostyle Co. marketed the first rotary stencil duplicator in 1898. The Rotary Neostyle was advertised with a choice of hand crank, foot treadle, or electric motor. There is nothing in our records that say which we purchased. After combining with the Methodist Church, their church building became the Parish House. In 1923 The Trustees voted to wire both the parsonage and the Parish House for electricity. The Parish House cost $160. And in 1927 electric lights were installed in the church. As the years progressed so did the updates and repairs to the building. In 1966 when the congregation moved to 1400 Lehigh Station Road, everyone was thrilled with “the state of the art” building. Now 50 years later we have a new to us organ, electric piano, sound system with wireless mikes, LCD projectors and computers to play powerpoint presentations and DVD’s, to say nothing of streaming off the internet with our wireless connection. Our copier makes two sided copies, staples and makes photo quality prints. All of this we take for granted. Wouldn’t the church congregation of 1916 be amazed to attend a service in our current building with our amazing technology? Do any of you ever ask who Ruth Worden was when you enter the Library/Lounge? Ruth was born January 24, 1926, in Rochester and grew up on the Eastside, graduating from East High School. After World War II, her family moved to the west side and began attending the Genesee Baptist Church, where she met her husband, Gordon Worden. They married in 1948 and in 1952 moved to Lehigh Station Road in Henrietta. They began attending this church and raise their 4 children. Ruth was active in Sunday school, Vacation Bible School, Choir, and Women’s Fellowship but, most importantly, it was through her efforts that a small church library was begun. A decision was made in the early 60’s to go to Africa as missionaries and they began their training through the UCC. 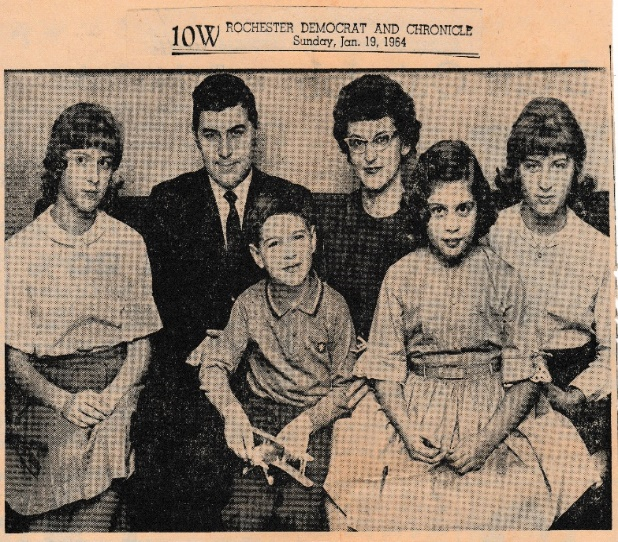 In August 1964, the Worden family joined others from Rochester at Mount Salinda Mission in Rhodesia. With the love and friendship of missionaries and residents, the family readily adjusted to life on the mission field. Gordon served as Field Treasurer for the work in Rhodesia. Ruth quickly organized the home and readied the children for school. It was Ruth’s responsibility to teach the youngest Paul, using lessons furnished by the government. In addition, she began language study and involvement in African women’s work, met in small groups with other mission wives, and participated in sports activities. During her short time at Mount Selinda, she felt her greatest contribution was in being a listener. While her oldest girls (twins) were vacationing at home in Henrietta, Ruth became ill. Little did the family foresee that five days later she would die of a massive infection that lodged in her heart. On January 18, 1965, at the young age of 38, Ruth left her family. While the family suffered a great loss, through the strength and faith demonstrated by wife and mother, they were able to continue the work God called them to do. Gordon wrote a 3 page typed letter to the congregation sharing Ruth’s last days and how the family was continuing on their mission. In 1978 Gordon contacted Henrietta UCC and donated through Memorial Gifts in Ruth’s memory 4 modular Bookcases, a large conference table and 12 chairs. The congregation officially designated an area in the back of the sanctuary on March 1979 the Ruth Warden Memorial library. Before that the “library” was housed in the Sunday school office (Martha’s office now). This relocation made the books much more accessible. After Community Child Care closed in 1999 the library shelves and books were moved to the room across the hall from the church office. The conference table has moved around the building and is currently in fellowship hall. After the 2013 renovations a new library/lounge was established as we see it today, complete with the sign by the door. Our church has been here in Henrietta for a very long time, but after World War II Henrietta began to grow with the building of the new subdivisions like Suburban Heights between Castle Rd and Calkins Rd. New churches like John Calvin Presbyterian were beginning to be established and old ones were growing. In 1963 a group of clergy from the Protestant, Catholic and Jewish faiths met and decided to take a survey of the town residents to help plan for the future growth of the town’s faith community. At that time there were 13 Christian churches and one synagogue. On October 13th, over 200 trained volunteers set out to knock on over 4,000 doors. The pollsters asked what church or synagogue the family attended, religious preference if not a regular worshiper, and the number of school age kids in the household. No poll taker was to enter a house or evangelize. This effort, and its success, may be the foreshadowing of the Rush Henrietta Interfaith League. The pollsters successfully contacted 85% of Henrietta’s families that day. With followup visits and phone calls, 98% were completed. An amazing total for a survey! The survey found 42% of the residents were Catholic. Each of the Protestant denominations was 10% or less. 2% had no preference and 1% declined to answer. There were 120 families that listed affiliation with 32 religious groups not represented in Henrietta. Today, a door to door survey would be a daunting task. We now have 17 Christian churches listed on the town website, one synagogue and one Hindu temple. Henrietta has gone from 2,700 residents in 1940, to 11,500 at the time of the survey, to 42,500 in 2010. That is quite a growth spurt. 1930 marked the start of troop 153 sponsored by the Men’s brotherhood. When World War II started the troop was combined with another for a couple of years but reestablished itself in 1943 and was continuous well into the 21st century. It is now inactive but the scouts of this troop were able to wear the highly prized 50 year bar on their uniform. The troop met at our church weekly and was run by the scouts. 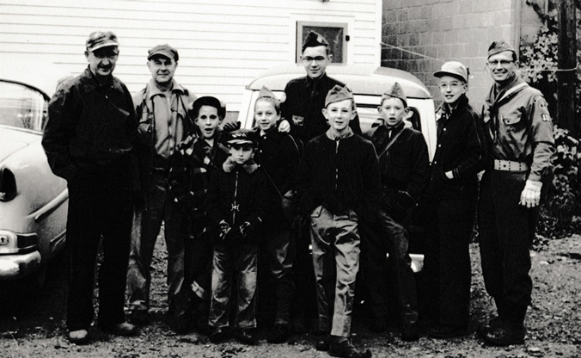 At these meetings the boys learned scouting skill for merit badges and planned outings and events. Campouts were held throughout the Finger Lakes area and Western New York. 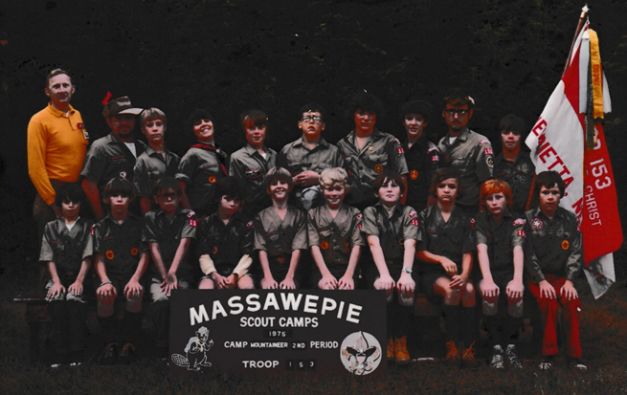 A yearly highlight for the scouts is the week at Massawepie near Tupper Lake. Merit badges were earned and community service projects completed. We all looked forward to the annual pancake breakfast held in fellowship hall in March. The last couple of years the scouts participated in Shanty Town. Not too hard for these seasoned campers. 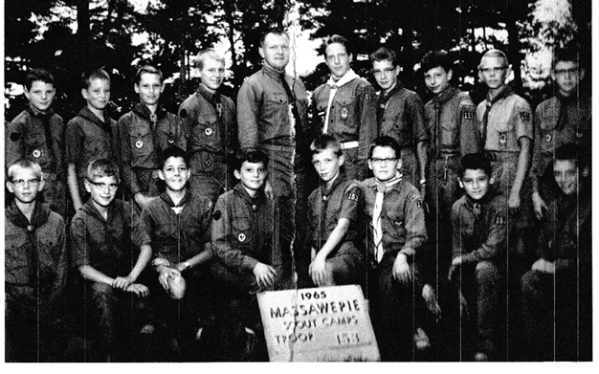 Many boys who were part of Troop 153 were also members of this congregation. I have used a few pictures from 1955, 1965, 1975. Do you recognize anyone? A 2 012 independent research study conducted by Baylor University found that Eagle Scouts are more likely to be involved in their community, hold leadership positions, and have closer relationships with family and friends than men who have never been in Scouting. Only about 5% of scouts earn the prestigious rank of Eagle Scout. We have had 6 here in troop 153. They include: 1949- James VanOstrand, 1972- Steven Buxton, 1982- Paul Buxton, 1984- Christopher Turner, 2001- Simon Vera-Schocker, and 2006- Robert Hand. Our congregation has seen other boys earn Eagle Scout rank, most recently Will Markwick, but they were not members of troop 153. This is a major achievement earned before the age of 18. Doers of the Word- D.O.W. is a church “club class” that was active for many years. Reverend Loughhad formed the first group in 1931 as a couples club. Through the years the membership ranged from 18-80, and was not limited to couples but expanded to include whole families. This group supported the church in many ways, raising money for the budget, a new organ, and a water line to the parsonage. But the most interesting project was the support or “adoption” of several Korean orphans. The DOW put on suppers, plays, minstrel shows and fashion shows. The Korean children supported included Choi Hyon Suk and Soon Im. The D.O.W. contributed $15 a month through Foster Parents Plan Inc. There was a translation service, and letters from Soon Im are in our historical files both in Korean and translated to English. These children were sponsored through the 1950”s. By the time I joined the church in the 70’s I don’t remember the D.O.W. being active. The Guilds had become the active groups. This desire to help didn’t waiver. After the Viet Nam War there were many families displaced and living in refugee camps not unlike today. Henrietta UCC stepped up and sponsored a Laotian family. The Souvannavong family arrived June 5, 1979. 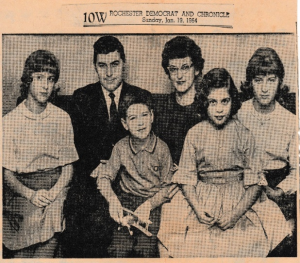 This family of 9 made it to Rochester after a month of traveling from a camp in Bangkok to Hong Kong, Tokyo, Seattle and New York City. The children ranged in age from 5-19 years of age and arrived with 2 small boxes and one suitcase. They were all tired but happy to see several people from their native country, as well as their American sponsors. 40 members of our church had worked many hours getting their new home ready for their arrival. The Rochester Laotians and members of our church had to explain electricity, running water, bathrooms, door locks, light switches and telephones (rotary dial at that time). I donated my electric stove when I purchased a new one and watched as the family was amazed to see the heating coil instead of a place to lay a fire. Ask the Eckardt girls, Lisa Nevol, MaryKaren Petroski and Jenny Lucey what they remember. Along with Julie Richards, they visited to help the kids adjust to the new life here in Rochester. Our support and contact with the family lasted for many years. After 4 years the family had to move and again Barbara Witmer helped them find a new home and the congregation assisted with the move. If there is any member reading this that might have contact with any of the family, please give me an update. The Women’s Fellowship is carrying on with this tradition of helping children and families. Today the women sponsor Jose, a boy from Appalachia, through Children Incorporated. This is carried out through Jose’s school. We send money, but we also send gifts, school supplies for birthdays and Christmas. Copyright © 2019 Henrietta United Church of Christ.